If they are old enough to walk, they can complete 100 yards! 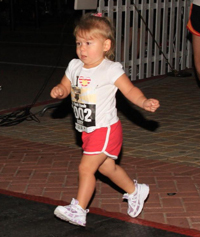 We're happy to offer the Kids' 100 Yard Dash in addition to our longer distance events, the 5K and half marathon. The 100 Yard Dash will begin at 7:00 am (the half marathon starts at 7:30 am, and the 5K starts at 7:45 am). This way, parents can participate with their children before their own race and still have time to leave them with other friends or family at the race site or take advantage of the free childcare option we are offering thanks to the Goddard School and a Real Bookstore (pre-registration online required for childcare). Enjoy cheering on all the children as they sprint to the finish. We plan to start them 100 yards from the finish line arch and then let them run it in for a spectacular finish! Parents are not required to register for the event to run with their child but we encourage those with children 5 and up to please let the children participate by themselves. a The Active Joe dog tag at the finish line afterward to celebrate their active accomplishment! We're proud to offer a family-friendly event that motivates everyone to get active!